A pool filled with green water surrounded by the rocks of the desert below a blue sky in the beautiful valley Wadi Bani Khalid. 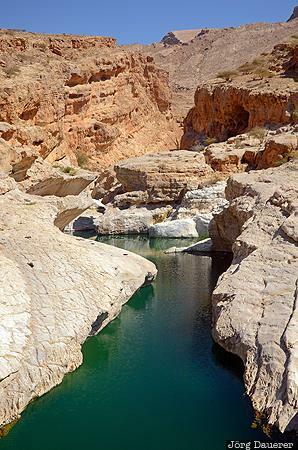 Wadi Bani Khalid is in Ash Sharqiyah in the Sultanate of Oman. This photo was taken in the morning of a sunny day in March of 2012. This photo was taken with a digital camera.